even weak as he is? Let the illness run its course? to help rebuild his strength? in circling succession of emails. with the last doctor appointment. until a plan of action became clear. Together we now know what to do. how much we’re not seeing. Who can help increase that wisdom? those who are in our care. 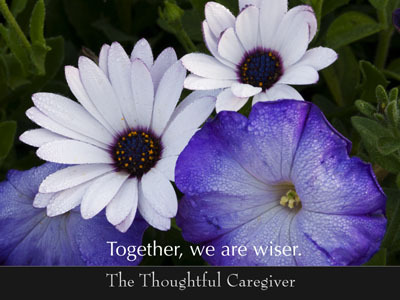 This entry was posted on January 10, 2008 at 9:37 am and is filed under Caregiver Truths, Caregiving, The Possibilities. You can follow any responses to this entry through the RSS 2.0 feed. You can leave a response, or trackback from your own site.